The cake is super tasty, not overly strawberry-laden, just enough to get that hint. But then the frosting hits your taste buds and there’s no going back. Definitely worth a try if you’re a strawberry lover. Place strawberries in a small food processor; process until pureed. You should have about 1/3 cup of puree, add a few more strawberries if necessary or save any extra puree for frosting; set aside. In a medium bowl, whisk together flour, baking powder, and salt; set aside. In a small bowl, mix together milk, vanilla, and strawberry puree; set aside. Divide batter evenly among prepared muffin cups. Transfer muffin tin to oven and bake until tops are just dry to the touch, 22 to 25 minutes. Transfer muffin tin to a wire rack and let cupcakes cool completely in tin before icing. Cream the butter, confectioners’ sugar, and cream cheese in your mixing bowl at medium speed. Add the strawberry puree and vanilla, and beat for 1 minute, cleaning sides as needed. Add the milk and a little red food coloring (if you’d like a deeper pink color) and beat until completely blended, about 1 minute more. If the consistency is still slightly runny, add a little more powdered sugar. 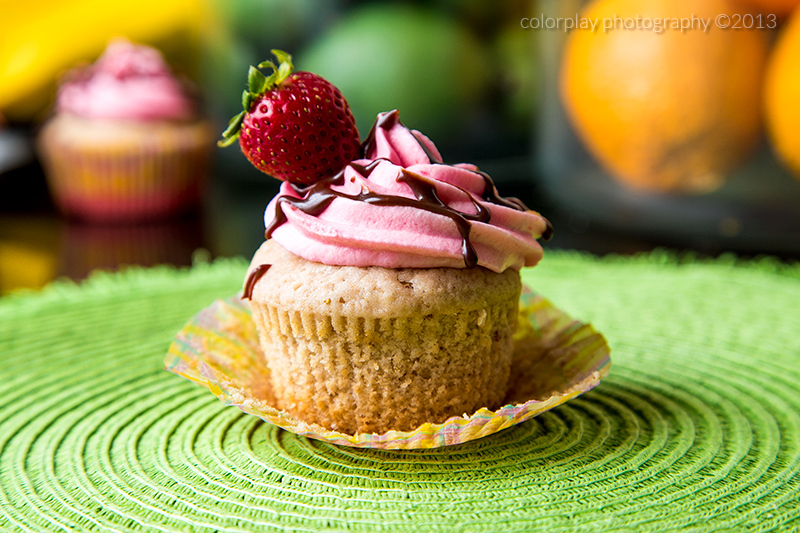 Frost the cupcakes using a knife or pastry bag with star tip. Place the chocolate chips, heavy cream and butter in a double boiler. Stir until melted. Add in vanilla and stir until glossy and smooth. Drizzle over frosting. I’ll admit it – cupcakes and I have a love-hate relationship. Or maybe it’s my oven and cupcakes have a love-hate relationship. Either way, it’s taken me forever to get the proper time to temperature ratio. But, by George, I think I’ve got it! I loved the brightness of the lemon (if that’s even a culinary expression, if not – I call dibbs!) paired with the bitterness of the semi-sweet chocolate in these cupcakes. 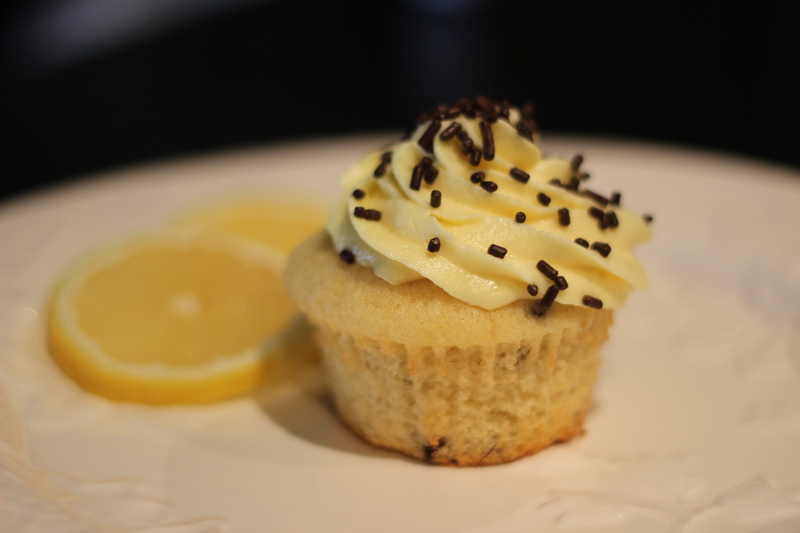 And the icing was light and not overly sweet – the perfect combination in my opinion! 2. Put paper cupcake liners into muffin cups. 3. Place flour, cornstarch, baking powder, and nutmeg in a bowl and mix together. 4. Place the butter and sugar in the bowl of your mixer and beat on medium-high speed, until the mixture is light and fluffy (about 3 to 4 minutes). Scrape sides as necessary. 5. Beat in eggs, 1 at a time, until thoroughly incorporated. Add in vanilla and lemon zest. 6. Add half the flour mixture and mix until blended. Add half the milk. Mix in the remaining flour mixture and then the remaining milk. 8. Using a small ladle or scoop, spoon the batter evenly into the paper lined muffin cups. 10. Remove cupcakes from tin and place on cooling rack. Allow to cool completely before frosting. 1. Cream the butter, confectioners’ sugar, and cream cheese in your mixing bowl at medium speed. 2. Add the lemon juice and vanilla, and beat for 1 minute, cleaning sides as needed. 3. Add the milk and the yellow food coloring and beat until completely blended, about 1 minute more. I ended up using a star piping tip to make my “beehives”, simply trying to mound up the frosting (as they recommended), didn’t seem to look right.